If you must know more, or like cats, you can click through the slide show below! I studied Biology and Graphic Design at Mizzou. I fell in love with ceramics during my final semester at Mizzou! I Craigslisted a kiln and wheel. I searched for an apartment with a creepy basement. 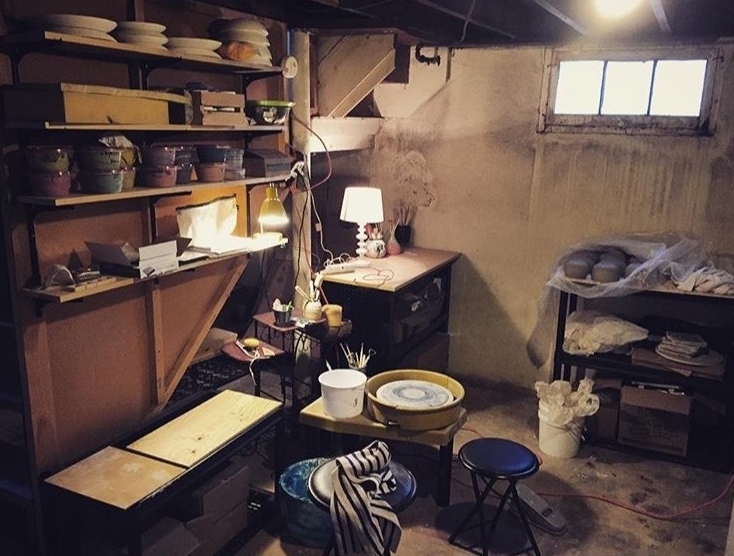 I made that creepy basement my studio! I have to write down ideas if I wake up at night. I mix my own glazes. There are a lot of variables that go into ceramics! I assume my neighbors think I'm odd. Sometimes I just wing it. Ceramics is a mystery! Sometimes I want to curl up in the fetal position & cry! There are good parts, like art fairs! I like to paint too! My best friend is my cat Calvin. He loves me, I swear. Then I met the most wonderful man. My cat loves him too. Back to my cat, he does yoga. I love to go too concerts. I've seen Slipknot 3 times. I wear this mask whenever possible, because it's cool. I cannot resist a bloody mary! Craft beer festivals are a must! Getting ready for some shows! I didn't know I could love a cat so much.